I recently picked up a few of Sally Hansen’s recently launched Color Therapy argan oil-infused nail polishes when they went on sale at Shoppers Drug Mart. My review of Powder Room covers the product line in more detail; I’ve also reviewed Slicks and Stones. Is it just me or do the rose gold caps go with everything? Therapewter (130) is a semi-sheer metallic microglitter that a beautiful antiqued silver color, with more than a hint of greenish, old gold. It can look like a tarnished pewter, though it actually reminds me a little bit more of pyrite, a.k.a. fool’s gold. Two coats was good for semi-opaque coverage. It’s actually quite blingy so even though two coats looks a bit sheer up close, from a normal distance it certainly looks like it offers enough coverage. Application was pretty easy and forgiving with the large, fat, paddle-shaped brush. This combination of color and glitter is fairly unique in my collection—mostly because I don’t own that many glitters, relatively speaking—so I’m happy to have it. It’s a nice twist on the typical gold and silver metallics for the holidays. Sally Hansen’s Color Therapy line isn’t the cheapest at the drugstore, but the quality seems reasonable for the price. 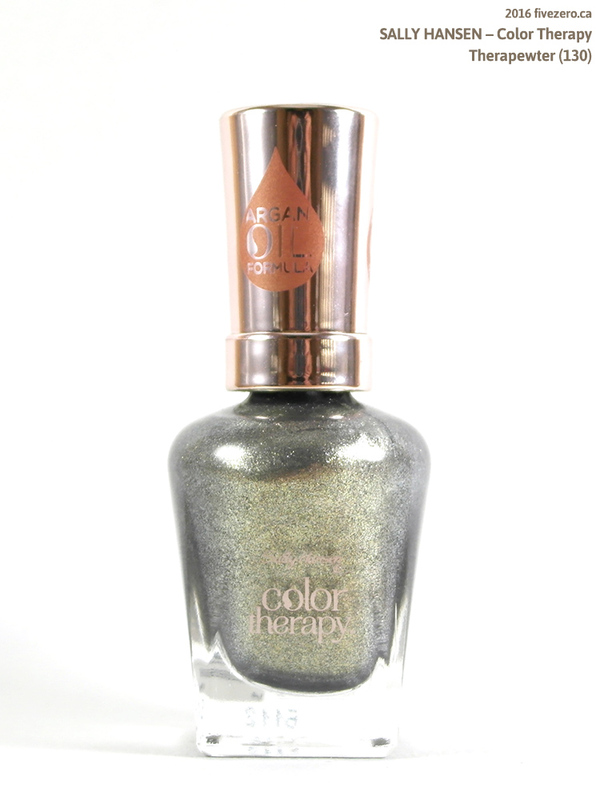 Sally Hansen Color Therapy contains 0.5 US fl oz / 14.7 mL and retails for CA$11.95 (I’m having a hard time finding the US price; is this even in the US?). The formula is free from toluene, formaldehyde, formaldehyde resin, camphor, and dibutyl phthalate (DBP). It contains a number of oils (castor, argan, evening primrose and safflower). Sally Hansen’s website states that Sally Hansen and her husband developed a Hard as Nails nail treatment in the late 1950s. (This begs to differ! How odd. There isn’t even a Wikipedia page on the woman or the brand!) Anyway, Sally Hansen, the company, was purchased by Coty Inc. in 1997 when the cosmetics giant acquired Del Laboratories, which owned brands like Sally Hansen, La Cross, and NYC (New York Color). Coty itself was founded in Paris, France in 1904, and is owned by a German holding company and headquartered in New York, NY, USA. “Therapewter”. Really, Sally Hansen? This is the name your folks came up with?!! But, this shade is pretty. Still not sure if I can get on board with the wonky brushes. That is a really interesting color! I am not big on super-blingy metallics, but might have to pick that one up because it looks so unique.